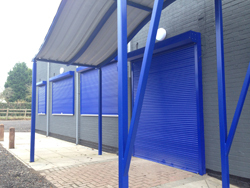 The Samson range of security shutters is vast, and for many reasons too. 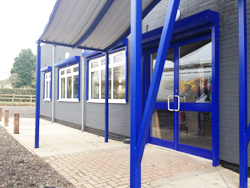 Apart from having a range covering requirements from low level security through to high level security there are also many different slat sizes and shapes available in steel or aluminium and whilst there are obvious differences in the use depending on the size and level of security required it is not always obvious why you would have the security shutters electrically operated. The perception they a lot more money is simply not the case generally as the price of tubular motors has become similar in cost to a locking set, spring balance system and handle for a manual shutter. The convenience factor is obvious when the shutters are fitted externally of course or when they are also in difficult to reach places. In most cases we find there may be a few security shutters and one or two have to be electrically operated due to their size and this drives the resoning for making the other smaller shutter also electric operated. Electric motors are required on all larger security shutters once the size and therefore the weight becomes too much for a spring balance or geared manual winding system. Tubular electric motors fit neatly inside the axle of the shutter and operation in its most basic form is by a push button momentary switch sending the shutter up or down and the motor will stop once it reaches an adjustable limit set during installation. The power requirements for almost all tubular motors is only 240V and supplied via a 13 amp witched fused spur or a 13 amp switched wall plug. It is suggested the power is provided by an unprotected fused spur as the motor on startup may trip the RCD on the main fuse board system. The electric plugs and spurs should be fitted with a 3 amp fuse. The convenience of electric operated security shutters, especially when there are several is hopefully obvious. Closing several door and window shutters manually one by one can become tiresome, and worse still potentially lead to the closing not being carried out every time. The wall switch or push button operation is the most basic form of control for a security shutter of any size but to fully comply with the health and safety regulations the person operating the electric shutter must be able to monitor the progress of either the closing or opening cycle throughout the entire operation. Alternatively, an audible and visual warning must preced the operation os the shutter(s) on every elevation of any building where electric shutters are installed. Security shutters with open, grille type lath sections which are not glazed are recommended to only ever be operated by a 'hold to run' switch with the controller in full view of the shutter. Any clothing caught in the shutter or fingers, hands, etc whilst the shutter is moving can have obvious terrible consequences. If any remote controls are to be used then the operational safety is even more important and in many cases with larger shutters, especially fitted over doorways and patio windows it will be a requirement to install a safety edge detector on the leading edge of the shutter combined sometimes with an infra red beam system, especially in public places. You cannot have an electric shutter closing with the slightest danger of any person or body parts being trapped underneath without a safety system to stop the electric motor immediately. The same rule will apply to shutters fitted with timers for example. If no one is able to see the shutter operating with total control then a safey system has to be incorporated. It is not necessary to have an electric security shutter with a manual override, unless of course the shutter is over a doorway or any form of entry and exit to a building which may prevent escape. This is not necessarily a health and safety issue but just common sense. If you have several electric shutters over small windows on a house or shop for example and they do not serve any purpose but to be a window then why bother with a manual override system? If the window or doorway is critical for the property for any reason then a manual override should be incorporated, and these can be inside or outside as required. To have a manual winding system override means you will cover all eventualities, if you opt for the battery back up system then you will only be covering for electric power cuts. This is a decision to make when specifying electric security shutters to any property but in most cases we obviously recommend a manual override system of some sort. Most tubular electric motors can be specified as either hard wired for their control or wireless, with an inbuilt receiver with the electric motor for remote control accessories to talk to. For remote control electric shutters the wireless motor provides the easiest setup and installation, and also gives a degree of 'future proofing' as other accessories using a radio signal can be added later with no further wiring. The hard wired systems are generally used for single electric security shutter installations where the control is by a keyswitch or push button as this is cheaper to install, and if there is only one shutter (over a shop for example) why have anything else? The perception that a remote control system will be more secure is not real as we tend to ensure all keyswitches fitted externally are housed in a lockable steel box and there are also 'anti tamper' control key switches available. Hard wired control for a multiple electric shutter installation might make sense if there is a central control point in a property where other remote control systems and home automation systems are being controlled from. If, for example, you want to use a controller software interface from a tablet or smartphone then the various systems available in the UK would probably want a cabled control going into one central place, rather than trying to interface with a 'foreign' wireless system possible on a different frequency too. Home automation systems are best with a control room where all items have their cabling directed to for ongoing updates and changes.